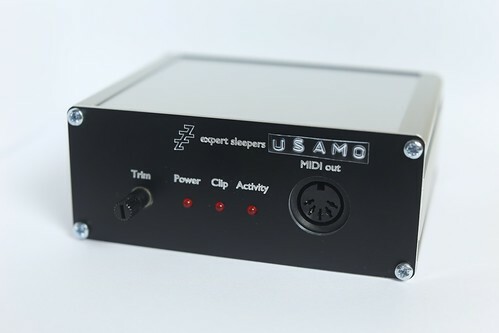 We’re delighted to announce the first non-Eurorack Expert Sleepers hardware product: the USAMO. The Expert Sleepers USAMO (Universal Sample-Accurate MIDI Output) provides a sample-accurate, jitter-free MIDI output from your DAW. The MIDI signal is generated by the USAMO software, a plug-in which runs as a virtual instrument (AU/VST/AAX, Mac & Windows), as audio in your DAW. The DAW sends MIDI to the plug-in; the plug-in translates that to audio and sends it to the USAMO hardware, via an output on your computer's audio interface. The USAMO then reconstructs the MIDI and outputs it on a standard 5 pin DIN MIDI socket. In addition to MIDI note and controller data from the DAW, the USAMO software also generates MIDI clock, Song Position Pointer etc. It can also handle Sysex. Because the MIDI signals are generated and transported as audio, they are guaranteed to be sample-accurately synced with your audio, and free of the jitter often associated with computer-generated MIDI. The USAMO will launch at NAMM in January 2015.